Kato switch machines are small and reliable. However they operate in a manner unlike any other machines. They are a single coil polarized solonoid. A pulse of one polarity throws the turnout, and a pulse of the opposite polarity closes it again. This Note shows how to control these with a SPDT switch or relay contact. Many turnouts are controlled by dual coil solenoids and others are controlled by small motors. The Kato turnout is the only one that I am aware of that uses a polarity sensitive single coil solonoid. To operate reliably, but without danger of damage to the coil, it must receive a brief pulse of one polarity or the other. The Kato manual operator accomplishes his by mechanical means. However a normal panel switch or push buttons are not normally able to do this electrical trick. Figure 1: Wiring schematic for Kato switch machine. The easy solution is to include a large value capacitor in series with the coil. 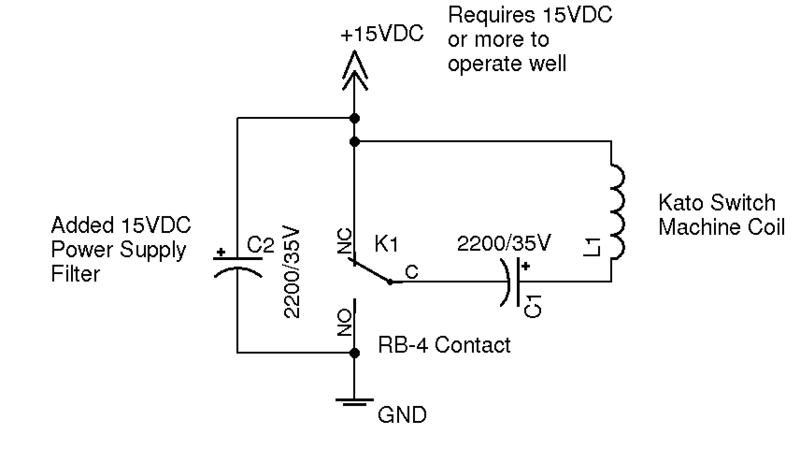 This capacitor is driven by connecting it to either a positive voltage, or to ground. This causes the capicitor to either charge or to discharge through the coil which provides an ideal pulse for its operation. In Figure 1 we see that the SPDT switch or relay contact is connected with one side to +15 volts, and with the other side connected to ground. The capacitor as shown is discharged through the coil. If the contact is reversed, then the capicitor initially places 15V across the coil which throws the machine. The capacitor quickly charges itself and the coil voltage returns to zero, preventing any over heating of the coil. When the contact is returned to its normally closed position, then the voltage on the capacitor is discharged through the coil which causes a reverse pulse. The reverse pulse returns the coil to its normal position. For this normal operation the Red switch machine wire is connected to +15V, and the black switch machine wire is connected to the positive capacitor connection. You can reverse the direction of the turnout points simply by reversing the red and black leads to the remote control solenoid. Some power supplies may not be able to supply the required surge of power sufficient to throw the turnout properly. 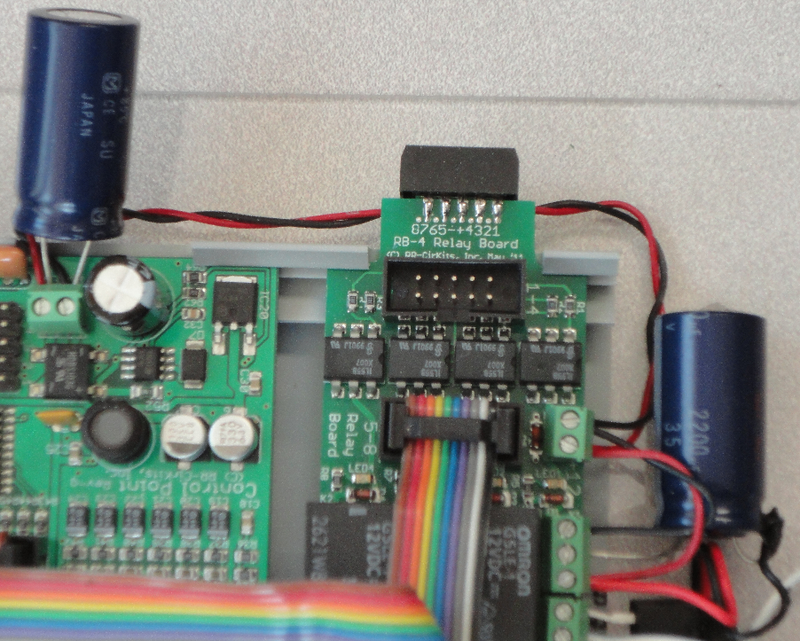 This may be improved by adding another large filter capacitor on the output of the power supply and/or by increasing the power supply to a higher voltage unit. In my experience 12V was not sufficient to throw the machines, but 15V or more does work OK with the added boost filter capacitor. Solonoid machines in general may not actually be in their expected position if they are manually moved from the last commanded position. This is especially likely with the Kato machine because there is a handy manual operator on the top of the remote actuator. Unfortunately obtaining indapendent position feedback from a Kato turnout is not easy to do. For my RR-CirKits demo layout I have modified the internal SPDT contacts to provide position feedback rather than the usual power routing control. I found this to be less than 100% reliable, but better than nothing for my purposes. Figure 2: Image of LNCP plus RB-4 wired to drive a Kato turnout. Red wire is 15VDC.